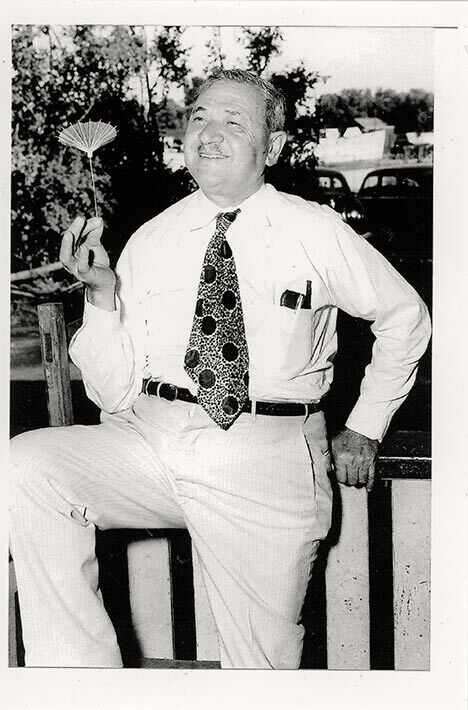 Hamilton businessman and grocery store owner, Antonio (Tony) Olivieri is pictured in this black and white photograph in formal wear, turning a cocktail umbrella inside out, smiling to the camera. In an interview with Tony McDermott, Antonio’s granddaughter, about her grandfather's internment, she explains how this is the way she remembers her grandfather, “Papa Tony,” best, “a lovely man, very happy”. He is pictured wearing a white shirt and necktie, standing outdoors on a porch. Some vintage cars can be made out in the background.